Even while dealing with her own tragedy, Mother Teresa practiced forgiveness and exemplified Christ's love. 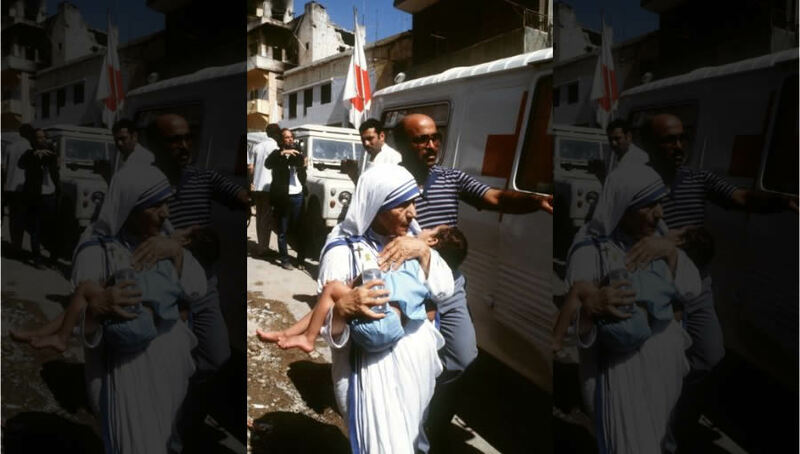 Mother Teresa hugs a child in West Beirut on August 14, 1982. No. She forgave the dictator and the Albanian government. Forgiveness and hope, compassion and revival: this was what Mother Teresa was demonstrating in her visit to Albania. Hoxha had kept her out of Albania and away from her close family for almost twenty years. The country’s isolation from the world was in full force. State control over citizens’ lives and the dictatorship of the proletariat and class struggle was complete. Foreign diplomats and state dignitaries knew of her desire to visit Albania and meet her family. According to her brother, Lazër Bojaxhiu, she had asked for help from president John F. Kennedy, Jacqueline Kennedy, French president Charles de Gaulle and the King of Sweden, Gustaf VI Adolf. Around 1965, Mother Teresa wrote the Albanian embassy in Rome, asking that her mother Drane Bojaxhiu be granted a visa to travel to Italy for medical treatment, accompanied by her sister Age Bojaxhiu. She explained that she had not seen her mother for over thirty years and this was probably the last chance to see and serve her aging mother. The state said no. This was followed by a second attempt in 1968. Maurice Couve de Murville, the French foreign minister who knew her personally, presented her request to Javer Malo, Albanian ambassador in Paris. Mr. Malo informed Enver Hoxha that Mother Teresa’s issue had been brought to the attention of various Albanian embassies in the West over the past couple of years. The logic behind the government decision is as follows: If both Drane and Age Bojaxhiu were granted permission to travel, they would probably not return to Albania. The Bojaxhiu family had two members, Mother Teresa and Lazër, living outside Albania, and in the eyes of the socialist state had a “bad biography” and was not to be trusted. Additionally, in 1967, Albania proclaimed itself the world’s only atheistic country and banned any form of religion. Religion was considered to be reactionary, backward, and an opium to the people. Religious women and men who had served in the country before the establishment of the Hoxha regime were either executed, imprisoned in labor or “re-education” camps, or expelled. Religion in general, and any personal religious leaning and activity, were severely persecuted. Mother Teresa, being a Catholic nun, was immediately classified as an enemy of the people. Mother Teresa made another attempt, requesting a visa so she could visit Albania for a week. Hoxha and the Albanian authorities were unmovable and unmoved by Mother Teresa’s pleas to visit her mother and sister and by the pressure from foreign diplomats. Mother Teresa suffered from the decisions. She accepted that her dream of seeing her mother and sister had vanished. In 1974, her mother died. Two years later, her sister died, at the age of 69. Their deaths and the inability to see them might have devastated Mother Teresa, but she kept it all to herself. She did not make any public announcements or media appearances to express her discontent or revolt against the Albanian government. She never publicly criticized Hoxha. Mother Teresa believed that it was neither her calling nor her vocation to criticize governments. She was more interested in fighting against materialism and indifference. Following Hoxha’s death in 1985, and the appointment of his close collaborator and designated successor, Ramiz Alia, the government followed a milder policy towards religion. By allowing a highly celebrated Catholic nun to visit the country, Alia wanted to signal a new direction for his country after almost half a century of severe dictatorship, one of the toughest in Eastern-bloc countries. According to Bashkim Pitarka, who was Albania’s chief delegate to the United Nations, Alia was contemplating a possible appearance before the United Nations General Assembly with the focus of re-establishing diplomatic ties with the United States, which were officially broken in 1946. Moreover, the Secretary-General of the United Nations, Javier Pérez de Cuéllar, had brought up the thorny issue of human rights violations and freedom of movement, especially the case of the celebrated Mother Teresa. According to Pitarka, de Cuéllar strongly encouraged Alia to end this mistake and allow Mother Teresa to visit her country. Mindful of the situation in Albania and the long-time hostility towards granting entrance to Mother Teresa, Alia presented Mother Teresa’s visit as strictly “private.” Mother Teresa wanted to pay homage to the graves of her mother and sister and visit their home in Tirana. On August 26, 1989, Mother Teresa set foot for the first time in Albania. Nexhmije Hoxha, the dictator’s wife, was among the first Albanian officials to welcome Mother Teresa in Albania. It is true that Mother Teresa never publicly criticized Enver Hoxha, or any other government or institution. She knew what he and his government were like. She knew what it had done to her family and had experienced its persecution herself. Why would she pray for Hoxha then? She did not consider her role as taking sides in politics or with or against governments. Her role was one God had given her. When he attacked her for laying flowers on the tyrant’s grave, Christopher Hitchens probably overlooked her religious conviction and Christian hope that “God has put good in the human heart.” Mother Teresa tried to find good in every person and in any state. Her particular calling was not to judge but to love. Ines Murzaku is professor of ecclesiastical history at Seton Hall University in New Jersey. A native Albanian, she earned a doctorate from the Pontifical Oriental Institute in Rome. She has written many scholarly works, including studies of Albanian church history and eastern Christian monasticism. Her most recent book is Medieval Italo-Greek Monasticism from St. Neilos to Cardinal Bessarion (1000-1500), published by Harvard University Press. Thank you for this detailed and insightful article about the life of Mother Teresa. I had the privilege as a seminarian of visiting Calcutta in 1982 and visiting the House of the Dying and the Mother House. As a Protestant I had always respected Mother Teresa, had read books about her and thrilled to be able to visit her mission. She had always impressed me as a Christian leader who was Real, Humble, Compassionate, and energetic with an energy and stamina that only God could provide. The truth behind this story, believe it or not, was that Mrs. Hoxha asked Mother Theresa to come to her husband tombs because all the soldiers kept there as guardians ended in psychiatric departments: from Hoxha grave many terrific noises and demons’ screams were coming out every night. Mrs. Hoxha, though she was in anyway a catholic, asked Mother Teresa to come to pray for these noises to cease. After Mother Theresa pray, Hoxha tomb was again quiet. I never knew this, though it took place in my youth. This a deeply touching story at the very least. Although I am a Protestant, the Catholic Church came into my world when I worked for the Diocese of Dallas, during the height of the Charismatic Renewal in Ann Arbor. The family who were leading that movement had built from donations and hard effort, a television studio, ostensibly to spread the good news of Jesus around the world inside the Catholic Church. I met many of the nuns and priests who entered this movement, because they agreed that a celebration of the Holy Spirit very important to the lives of millions of believers around the globe, and not just Catholics. By the time I left this humble facility, shared by the nuns of our district, I had met a thousand young men and women with a blaze of the Holy Spirit in their eyes! Though I never met Mother Teresa, her influence in this group was clearly felt, because she spoke of it and encouraged several young technologists to come and take the courses our group offered so that the messages would spread across India. I have loved that wizened little woman for her sacrifice and devotion for decades! What a wonderful store Inez relates! !